For the first time since the National Collegiate Athletic Association implemented its Academic Progress Rates, all nine UL System athletic programs received clean ratings free of penalty. The APR is a team-based measure that accounts for the eligibility and retention rate of each student athlete. Teams scoring below certain thresholds can face consequences, such as practice restrictions and limits on postseason competition. The NCAA began providing APRs in 2003 as an academic reform effort in Division I athletics. When compared to this time last year, student enrollment in the University of Louisiana System’s nine universities has increased by 1,814 students. The UL System is the largest higher education system in the state. Today marks Student Board Member Maggie Brakeville’s last meeting. For the past year Brakeville served as the student representative on the Board of Supervisors for the University of Louisiana System. She has been a committed Board member. She participated in two campus president searches, stood on the steps of the state capitol to rally for higher education during this year’s First Extraordinary Session and traveled to Washington, D.C. with the Council of Student Body Presidents to meet with Louisiana’s congressional delegation. 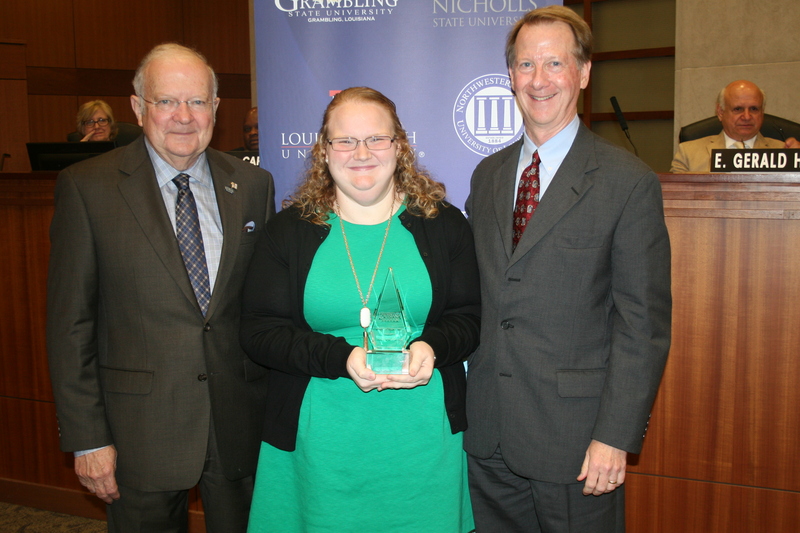 She recently completed her second term as Louisiana Tech’s Student Government Association president. Next month she is moving to Washington, D.C. where she will intern with the U.S. Senate Agriculture, Nutrition and Forestry Committee. She is scheduled to graduate with a master’s degree from Louisiana Tech in August. McNeese: approval to terminate the Post Baccalaureate Certificate in Music Education-Kodaly Studies effective June 2016. McNeese: approval to rename the College of Science to the College of Science and Agriculture and rename the Department of Agricultural Science to the School of Agricultural Science effective June 1, 2016. Northwestern: approval to award an Honorary Doctorate of Humane Letters to Dr. James Daryl Knecht at the Spring Commencement Exercises. Southeastern: approval of a Post Baccalaureate Certificate in Sustainability. UL Lafayette: approval to award an Honorary Doctorate of Nursing Practice to Dr. Craig Walker at the Spring Commencement Exercises. UNO: approval to merge the Departments of History and Philosophy. UNO: approval to merge the Departments of Curriculum and Instruction and Special Education and Habilitative Services. UNO: approval of a joint study collaboration agreement with Shanghai Maritime University. UNO: approval to move UNO-CHART from the Department of Sociology to the Department of Planning and Urban Studies. Southeastern: approval of a contract with Mr. Jason Hayes, Head Women’s Tennis Coach, effective June 1, 2016. ULM: for approval of a revised Athletic Home Game Complimentary Ticket Policy. LA Tech: approval to demolish the former Natatorium located on the University Campus. LA Tech: approval to demolish four structures located at 408 West California on the University Campus. LA Tech: approval to enter into a Facilities Lease with the Louisiana Tech University Foundation, Inc. concerning the property described as the Press Box and Sky Box at Joe Aillet Stadium. LA Tech: approval of a resolution approving the form and authorizing the execution of the Agreement to Exchange Realty and the Act of Exchange and the execution of any and all documents and certificates described herein. The University is further requesting to demolish improvements located at 810 West California Avenue. Nicholls: approval to demolish the Restroom Facility located at the Ray E. Didier Field Baseball Complex. UL Lafayette: approval to name its baseball complex Russo Park. UL Lafayette: approval of the form and authorization to execute a First Supplemental Ground and Buildings Lease Agreement and a Second Amended and Restated Collection and Disbursement Contract, to refund the Series 2006 Bonds. ULM: approval to accept donation of the Malone Stadium field turf from University of Louisiana Monroe Facilities, Inc.
ULM: approval to demolish Garrett Hall and the Garrett Hall Greenhouse located at 800 University Avenue on the campus of the University. UNO: request for approval to rename its Digital History Lab to the Michael Mizell-Nelson Digital History Lab. Grambling: authorized program discontinuance for Grambling Lab School to allow for Type 2 Charter School to be operated by Grambling High Foundation. Southeastern: approval to establish the James D. and Diana White Karl Superior Graduate Scholarship. UL Lafayette: approval to rename the Louisiana Health System/BORSF Professorship in Health Care Administration to the Lafayette General Medical Center/BORSF Professorship in Health Care Administration. UL Lafayette: approval to enter into a Cooperative Endeavor Agreement for Provision of Training. UNO: request for approval of a Summer 2016 Tuition Charge. UL System: approval of Campus Housing and Meal Plan Rates, Auxiliary Rates, Energy Surcharge, HB 152 and Non-Governmental Charges for Academic Year 2016 – 17. Southeastern: approval to appoint Dr. Tena Golding as Interim Provost and Vice President for Academic Affairs effective June 1, 2016. UL Lafayette: approval to continue the appointment of Dr. Gwen Fontenot as Interim Dean of the B.I. Moody III College of Business Administration effective July 1, 2016. UL Lafayette: approval to appoint Dr. Nathan Roberts as Dean of Education effective February 1, 2016. UNO: request for approval to appoint Dr. Kim M. Long as Dean of the College of Liberal Arts and Education effective July 1, 2016.